You might have noticed that things have slowed down for Third Window Films this year. The last film I reviewed from them was back in April, Destruction Babies. They usually have a bi-monthly release schedule, but this year, they’ve come up against one of those unforeseen circumstances that so often throw a roadblock in the path of the independent label. So this year has been spent in first gear while they sort out some distribution tangles, but that doesn’t stop us from being treated to a film from one of their favourite directors, Shinya Tsukamoto, best known for the Tetsuo films. 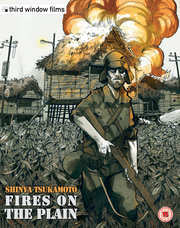 Fires on the Plain is his war epic, an adaptation of the Shohei Ooka novel. The war in the Pacific is coming to a close, the Japanese in retreat, and Private Tamura is stuck in the jungles of the Philippines as the Allies close in. But for the surviving Japanese forces, there is a far greater enemy than the Americans, or the Filipino resistance. Fires on the Plain gets a 1.78:1 widescreen 1080p transfer on this disc. During my childhood, the war movie genre was a glossy, Technicolor world, with vivid action and fiery explosions, albeit with a minimum of blood. Of late, the genre style has been one of ‘gritty’ realism, shaky cam action and harsh, de-saturated and bleach bypass colour palettes. So the aesthetic of Fires on the Plain might take a while to get used to, the digitally shot film emphasising and saturating the colour of the jungles to almost make it seem like a postcard composition at times, somewhat at odds with the beaten and grimy soldiers, and contrasting with the human detritus littering the jungle floor. On the other hand, the colour does viscerally emphasise the trademark Tsukamoto gore. The transfer is clean and sharp, and free of any compression, just what you would expect from a Blu-ray transfer of a digitally shot film. The images in this review were kindly supplied by Third Window Films. 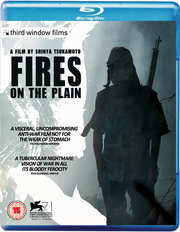 Fires on the Plain gets a DTS-HD MA 5.1 Surround Japanese track with optional English subtitles. You’re immediately presented with a shocking and dissonant soundtrack over the opening credits, but the music is sparingly used in a film that needs little accompaniment to emphasise its horror. The dialogue is clear throughout, the subtitles timed accurately and free of typos, while the sound design is immersive and effective, making full use of the surround soundstage. The disc presents the film with an animated menu. The audio commentary with Tom Mes is well worth listening to. He begins by stating that this film is not a remake of the 1959 film, rather a direct adaptation of the original source novel. 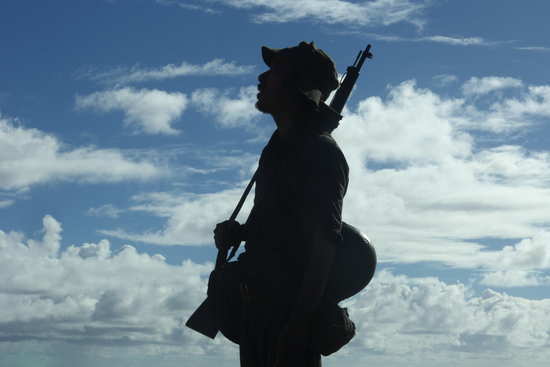 Nobi/Fires on the Plain: 20 Years in the Making is an interesting documentary to accompany the film, with an extensive interview with director/star Shinya Tsukamoto. Finally there is the trailer for the film. There’s not a lot that I can write about Fires on the Plain. For one thing, I am going to have to live with the experience for some time to fully comprehend it. The story itself is very simple; it’s not a plot that’s going to call for in-depth analysis. It’s just 90 minutes chronicling the survival of a man under horrifying circumstances. It’s also not a film that you enjoy, it’s a film that you endure. 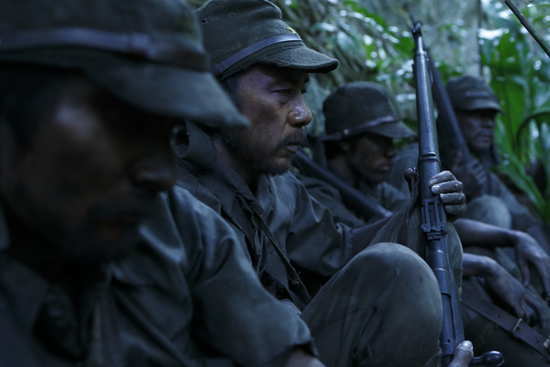 The important thing is that it is a film that is really worth enduring, showing a side of war that is rarely seen in cinema, despite the ‘realism’ in war films that has been the vogue since Schindler’s List and Saving Private Ryan. Cinema will still have us believe that adversity builds strength, that people will come together against overwhelming odds, that certain defeat will invoke heroic last stands, that eternal friendships will be forged under fire. Fires on the Plain does away with all that nonsense, and realises just how dehumanising war is, so stripping a soldier of the trappings of civilisation, of society that the worst enemies that soldiers in a defeated and demoralised army will face are each other. Private Tamura faces his personal Catch-22 at the start of the film, suffering from a lung condition so serious that his superiors don’t want him on the front lines, and order him to the charnel house that passes for a field hospital in the jungle. Only the medics tell him that he’s not sick enough to be admitted, and keep sending him back. That’s about as much humour as you can draw from Tamura’s situation, as the inevitable happens, the American forces arrive, and the retreat is sounded. All he can do is join the retreat, try and make it to some semblance of safety. Fires on the Plain plays it smart and rarely shows the enemy. 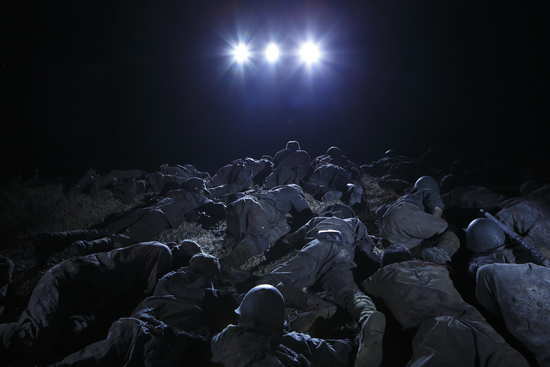 It focuses on the Japanese soldiers and how they interact in extremis. You might see the effects of a strafing run, the bright lights and massed gunfire of an ambush, but you never see the planes, you never see the GIs pulling the triggers. It focuses on the Japanese, and the horrors they endure trying to get to safety, all seen through the eyes of Private Tamura. As their straits get more desperate, what little humanity remains to them drains away as they turn on each other. In this regard it’s a war movie that has a lot in common with Lord of the Flies. 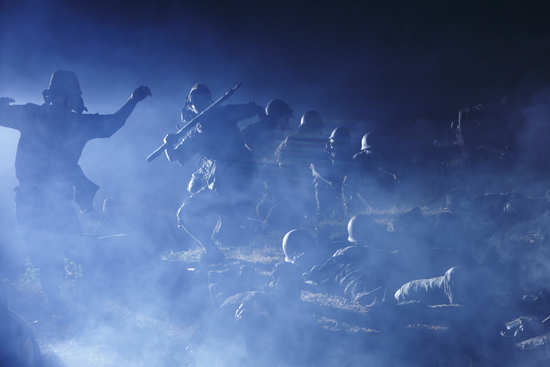 Fires on the Plain is not for the fainthearted, but it is definitely a film that you should see, offering a side of war that is rarely seen in cinema. It is strikingly cinematic too, at times contrasting the breathtaking, vivid beauty of Mother Nature, with the outright hideousness of human nature.